If you’re looking for a fun and festive treat to make, this fall medley granola is sure to deliver. This recipe incorporates all of the fall spices, such as cinnamon, nutmeg, and allspice, that are not only delicious but also leave your house smelling like an autumn wonderland. 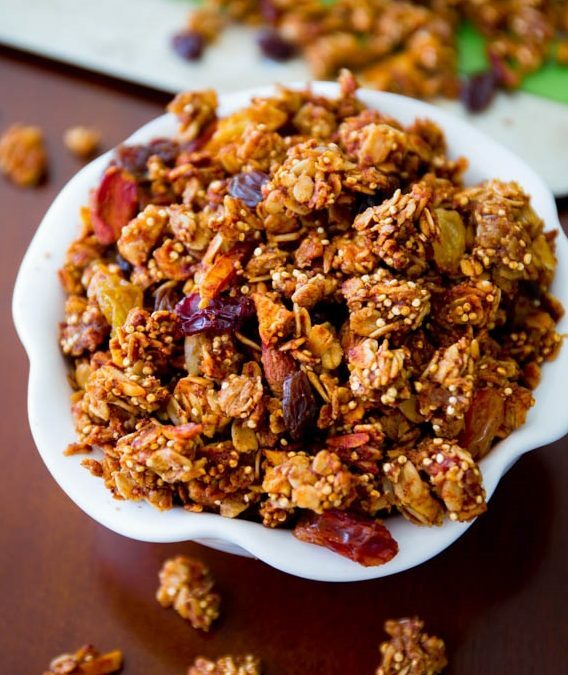 Packed full of complex carbs, fiber, and healthy fats, this granola makes for a great snack by itself or can be added to some yogurt for a tasty and filling breakfast. Preheat oven to 325 degrees. In a small pan over medium heat, combine coconut oil and honey. Heat until the coconut oil is melted then set aside. In a large bowl, combine oats, quinoa, almonds, pecans, pistachios, cranberries, salt, and spices. stir to combine then add the honey mixture, pumpkin puree, and vanilla. Stir until the oats and nuts are coated. Transfer the mixture baking sheet that has been sprayed with cooking spray. Spread the granola mixture evenly on the baking sheet and bake for 20 minutes. Remove from the oven and give the mixture a stir. Return the granola to the oven and bake for an addition 10-15 minutes, or until the mixture is golden. Remove from the oven and let the granola cool to room temperature. Store in an airtight container for up to two weeks.